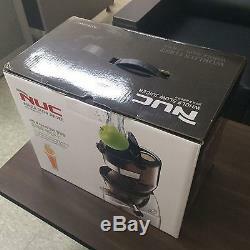 NUC KJ-623S Kuvings Whole Mouth Slow Fruit Juicer Juice Extractor (B6000S). Model Changed, Product Same : Kuvings KJ-623S -> NUC WSJ-972K. Model : KJ-623S (B6000S - Difference : Wide feed chute design, voltage) > Model Changed : WSJ-972K Color : Silver Speed : 60RPM Power : AC 220V / 60Hz, 240W Size : 228 x 208 x 443mm Weight : 6.7kg Maximum use : Less than 30 minutes Capacity : 400ml Materials : Ultem, Tritan, ABS, PC Do not insert any ingredients having many seeds or hard or big seeds(You need to cut the ingredients or remove seeds). Unless, it may damage the strainer and cause a failure to the machine. The innovation of Kuvings, the evolution of your health. KJ-622 Series : Korean version / B6000 Series USA version They have difference in Feed chute design and voltage. KJ-622 Series were released after B6000 Series and have voltage of 220V. Kuvings Whole Slow Juicer KJ-623S The NEWEST and LATEST model from Kuvings Korea >>English manual(not exactly for the model KJ-621W, but a common version) and English Juice Recipes(PDF file/eBook) are available! << Body : quite heavy duty motor, power switch, smart cap, two step safty system, BPA free juicing bowl, rotation wiper, ultem strainer, ultem juicing screw, wide feed chute, pusher Contents : body, cleaning brush, rotaiting brush, cleaning tool, blank strainer for frozen desserts, pulp cup, juice cup This Kuvings Slow Juicer is the worlds first wide mouth upright slow juicer. 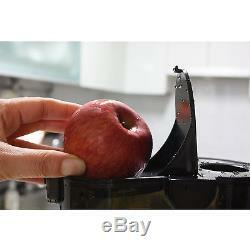 It can easily accept a whole apple and other large fruits and vegetables. The feed tube reduces prep time up to 40%. This revolutionary slow juicer can produce a glass of fresh juice in seconds. 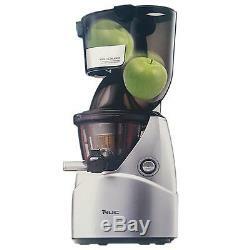 This slow juicer will not destroy nutrients and enzymes. The slow juicer is has a drip free Smart Cap. The Smart Cap mixes juices together and makes it easy to rinse the inside of the slow juicer when you are done or between recipes. All of the slow juicer juicing parts are BPA free. This slow juicer is compact with a beautiful design that will look great in any kitchen and it fits under most kitchen cabinets. The patented cleaning tool makes cleaning the screen easy. You also receive a blank strainer for making wonderful frozen desserts from frozen bananas, blueberries, strawberries and more. Most electronics from Korea have voltage 220V / 60Hz. If you don't use one, it may cause malfunction or product failure. If the plug type is different, please request for a multi adapter(Korean plug type is'C','F'). Some countries (Italy, Lithuania, Malta, Honduras, Kuwait, Uruguay, El Salvador, Iceland, etc) are not in EMS coverage. An invoice is added on the package on demand. Instead of box, in many cases, air cap is used for packing. If an item suddenly breaks down or does not operate in a normal way within 1 year, the problem will be analyzed and discussed. If it turns out to be a manufacturing defect. If it turns out to be a user's mishandling fault, the item can be repaired. We try our best to put customers' sastisfaction as first priority. Most of the time we find the resolution that satisfies customers needs. Please don't be so quick to leave negative/neutral feedbacks. We really appreciate your business with us. The item "NUC KJ-623S Kuvings Whole Mouth Slow Fruit Juicer Juice Extractor (B6000S)" is in sale since Tuesday, October 13, 2015. This item is in the category "Home Appliances\Small Kitchen Appliances\Juicers". The seller is "yr-rambo" and is located in seoul.